My dad complains that the problem with movies about aliens is that they all look the same and they all want to kill us. 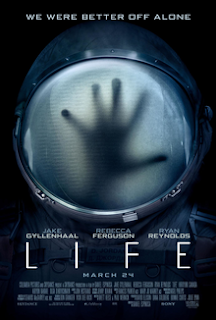 It’s hard to argue with a logic like that, and it becomes even more of a problem when that is the very thing that is driving the story of “Life,” which is little more than a movie where an unidentified life form is discovered and brought onto a space ship, with the crew fawning over it until it proves to be hostile and wants to eat everyone. It’s not a remarkable story and it’s certainly one I’ve seen many times before, but once in awhile the presentation creates real scares and tension, which is what people go to movies like this for. I’m not certain it’s going to dethrone the annual showings of Ridley Scott’s “Alien,” but I suspect many will find it to be a suitable placeholder until those nights make their annual appearance. 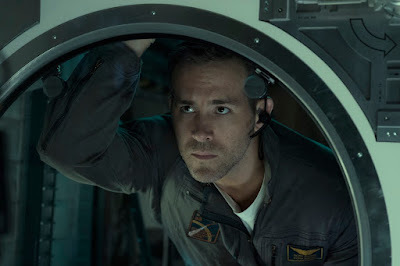 I suppose what adds more tension to this from the get go is that it has high profile actors like Jake Gyllenhaal, Rebecca Ferguson, and Ryan Reynolds headlining the thing, which means there is some serious questioning on who’s going to live at the end of all this. To say that people die in the movie is probably not a spoiler. What could be a spoiler is how they die, who dies first, and what happens to this creature when they do. Most of the actors are largely just doing enough to skate by, but it is nice to see film makers taking advantage of Reynolds quick wit and sly sense of humor. 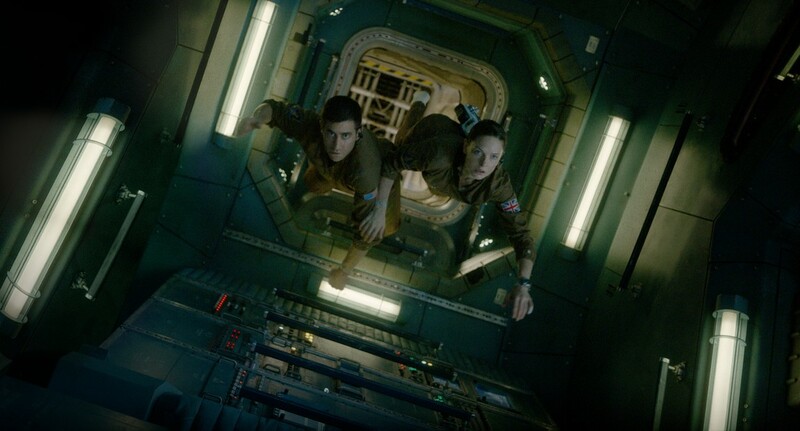 The special effects normally take center stage in a movie like this, but director Daniel Espinosa has gone with a minimalist approach and placed the focus on camera angles and lighting. This is something that Ridley Scott did so effectively with his killer alien movie. While the simplicity in the movie makes discussing it a little difficult, it is amazing how effective that simplicity frees the movie up to be what it ultimately is. Sort of like how Spielberg got a lot of mileage over a shark that eats people, so too does Espinosa with a white blob that seems to gain more personality the longer this goes on. As the creature gains more personality, so too does the audiences fear of it. The obligatory jump scares of the film are usually annoying and half baked, but here they seemed more calculated and effective, because are coming from a creature we begin to genuinely fear and want dead as soon as possible. I mean, sure, this is the case for most monster movies, but this is a rare case where there is no rooting for the creature to come out on top of the world. Maybe briefly during a particularly epic kill, but not much beyond that. What can make or break a movie like “Life” is how much you remember it. I think the movie would have struggled a bit in that department even with the wonderful production values, but thankfully in a world where no one can be offended and everything must be happy, the movie ends on such a dour note that it’s actually kind of brilliant. It elevates the movie into a sort of revenge classic of the most unexpected kind. I don’t personally see myself watching it again, but there were many times I was scared and uncomfortable, which is pretty much what movies like this promise to deliver and what audiences expect. The fact that this got an average C+ rating from test screenings is mostly likely because it pulls a fast one on the audience, which is apparent because one of my friends claimed the movie cheated him. I admit that I don’t fully understand where he’s coming from, as a movie whose purpose is to kill most of the characters already is likely never going to have the happy ending you want anyway. Parents, there is strong language throughout as well as some VERY gory moments! Recommended for ages 17 and up.